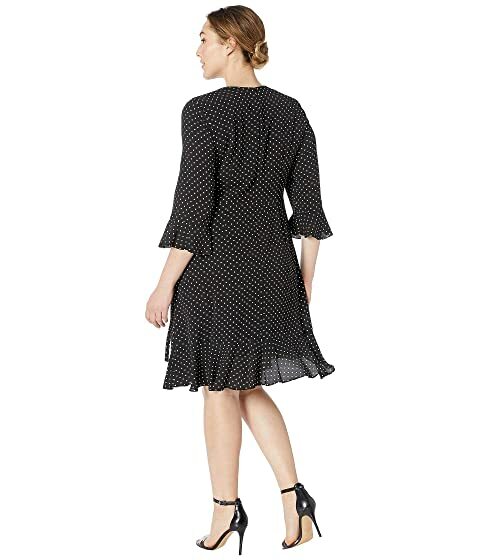 Grace the scene in this gorgeous Adrianna Papell® Plus Size Pindot Printed Ruffle Wrap Dress. Day dress in a flattering wrap silhouette. Polka dots on a stretch-poly fabrication. V-neckline and three-quarter sleeves with flared cuffs. Ruffled trim at front and hem. Fluttered hemline falls at a midi length. Product measurements were taken using size 16W. Please note that measurements may vary by size.